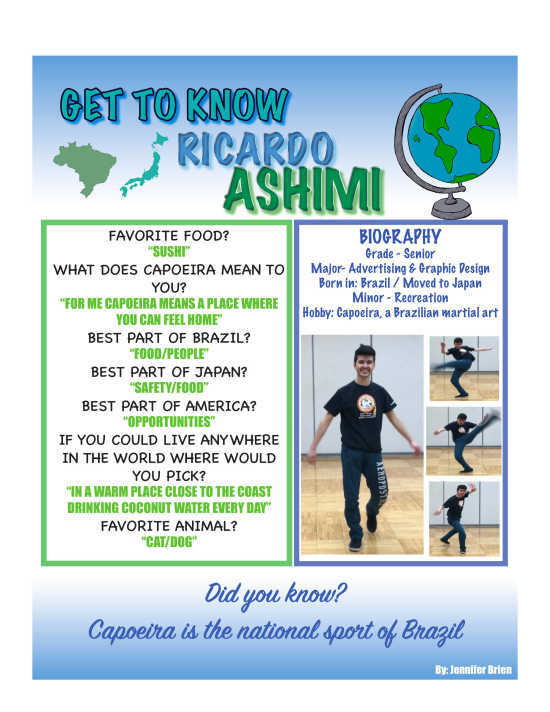 Brazil native Ricardo Ashimi brings culture to Southeast through Capoeira, a Brazilian martial art for which his passion grew stronger after his younger brother, Frodo, suffered an accident that left him in a coma for more than a week and in the hospital for three months. Frodo had a heavy work schedule as a machine operator and took pain killers due to the demanding hours of work. Ashimi said one day he just collapsed. The injury Frodo sustained caused him to have several aggravations specifically in his right leg. “That was the time I started Capoeira to be with him a little more,” Ashimi said. Capoeira combines dancing, music, singing and acrobatic moves such as cartwheels, jumping kicks and balances. It can be performed individually, but Ashmi said a large group is preferred. “Capoeira is very unique, especially because people think it’s a dance because we have music and different instruments and sing, but it is a martial art,” Ashimi said. Ashimi said he always liked Capoeira but never really had the time to do it until this semester. “This semester, I had to take one of my minor classes that is a practicum class and you have to work 40 hours outside of class,” Ashimi said. After talking with his boss at the Recreation Center, Ashimi was approved to teach his Capoeira class that not only lets him practice his hobby, but knock out some class credit as well. During his younger years in Brazil, Ashimi said he was not interested in Capoeira, which happens to be the national sport of Brazil, and instead focused his time in other martial arts such as boxing and karate. After moving to Japan, he saw Capoeira in a different light after Frodo’s accident resulting in him almost losing his right leg. Prior to the accident, Frodo was very involved with Capoeira. He became involved in Capoeira in order to bond more with Frodo, and eventually it became a passion. The two are now able to perform Capoeira together as his brother is recovered, only having limitations in certain movements. About four years ago, Ashimi heard of an opportunity to come to the United States. “I thought, ‘I don’t know English but I can learn, that’s fine,’” Ashimi said. The opportunity arose through a friend who is now a Southeast graduate and was visiting Japan during winter break. “My friend’s name is Karen and she went to the same high school and studied with my brother,” Ashimi said. When she came back during her college break, she mentioned the idea of pursuing a college degree in the U.S. to Frodo. Ashimi heard of the idea Karen proposed and became interested. “I heard about it and I said, ‘Why not?’ because my plan was to move to Brazil to do my higher education,” Ashimi said. However, plans of him and his brother both coming to the U.S. quickly changed. “The day before the VISA interview my brother gave up, he said ‘I’m not going anymore,’ and we kind of got in a fight,” Ashimi said. But at the end, Ashimi came by himself and began his college career at Southeast. That was four years ago. Now, Ashimi is a senior getting ready to graduate next semester as his time at Southeast is coming to an end. With graduation on the radar, Ashimi is keeping busy with his school work as a double major in advertising and graphic design, with a minor in recreation. During his free time he is working at the Recreation Center as a graphic designer, offering classes where students can learn the art of Capoeira as well as teaching it at elementary schools. “Sometimes I go to an elementary school and teach about Brazil and I bring a little of Capoeira because it is something I do and kids really like it, especially when you bring the instruments,” Ashimi said. With more time to practice under his belt, Ashimi already knows he wants to pursue teaching Capoeira as part of his post-graduation plans, with his day job consisting of a combination of advertising and graphic design. Ashimi plans on landing a job in Cape Girardeau but hopes to visit his family in Japan during the summer. He also is looking forward to challenging his brother in Capoeira, which has turned into a growing sibling rivalry.